Opéra de Montréal's latest Cenerentola is a far from minimalist delight! Nowadays, it seems even stagings of comic operas are enamored with minimalism, skewing toward a neutral palette of black, white, and grey. So how refreshing it was to revisit Catalonian director Joan Font and his maximalist Cenerentola, which explodes with all the colour and visual whimsy of a Gaudi mosaic. 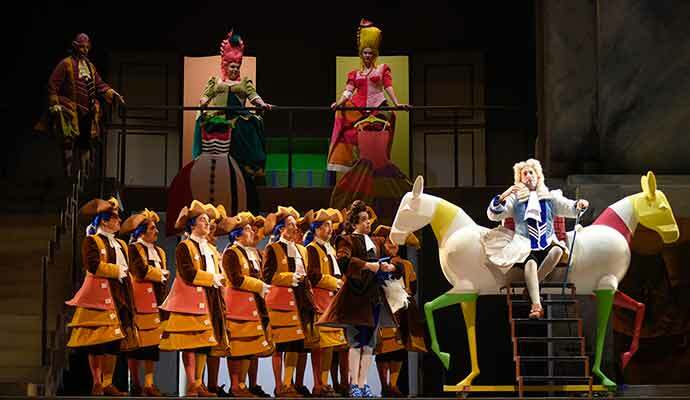 This revival of Font’s famous 2007 Houston Grand Opera opened at Opéra de Montréal on Nov.11. Ten years later, the staging has lost none of its wacky appeal. It’s still an eye-popping, technicolour spectacle, with an aesthetic somewhere between Willy Wonka and mid-century modern artist Charley Harper (my date said it reminded him of the “It’s a Small World” Disney ride, minus the annoying earworm). In Font’s concept (and Joan Guillén’s sets and costumes) shocking pinks, acid greens, lemon yellows, electric blues and candy heart lavenders all coexist happily. Font keeps it from looking cluttered and garish by framing things with clean geometric shapes. There’s a pleasing geometry to Font’s stage directions too. Instead of ignoring or glossing over the churning repetitions in Rossini’s score, Font underlines their comedic effect through energetic choreography, having the singers spin or bounce in time to the oom-pah beat. 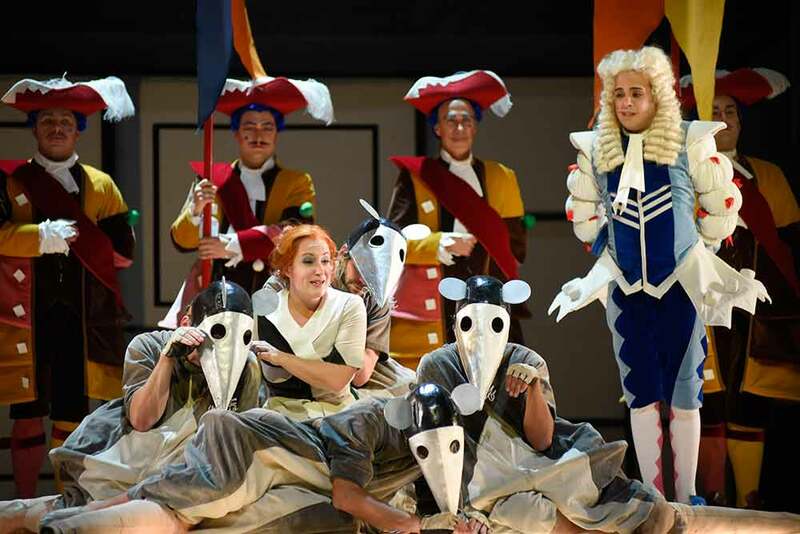 Meanwhile, dancers in pointy rat masks and long tails cavort and scurry about, Nutcracker-style, sometimes observing the scheming, other times participating in it—at one point even working the thunder and wind machines during the Act II storm sequence. I found myself constantly delighted, charmed, and utterly entertained. As the heroine, mezzo-soprano Julie Boulianne never put a foot wrong, sweet but with a solid core of iron will. However, her deep-ochre mezzo is perhaps a little serious for the role, and while her coloratura was impeccably tidy, I felt she was being cautious, just missing that element of razzle-dazzle. I wished she had gone for more speed, more variety, higher options—she certainly has the extension and technique. American tenor Juan José de Léon was more problematic as the prince, Don Ramiro. Yes, he has glorious high notes—the C at the end of his Act II cabaletta was thrilling—but what came before wasn’t always up to the same standard. His coloratura was slurred, his vibrato was often tight and too fast, and his habit of punching and spiking notes gave his phrasing a harsh, jagged feel. Among the supporting roles, Vito Priante stole the show as Dandini, the valet masquerading as his boss. He combines a gorgeous, toasty, nimble baritone with supremely cheeky, confident comedic timing. 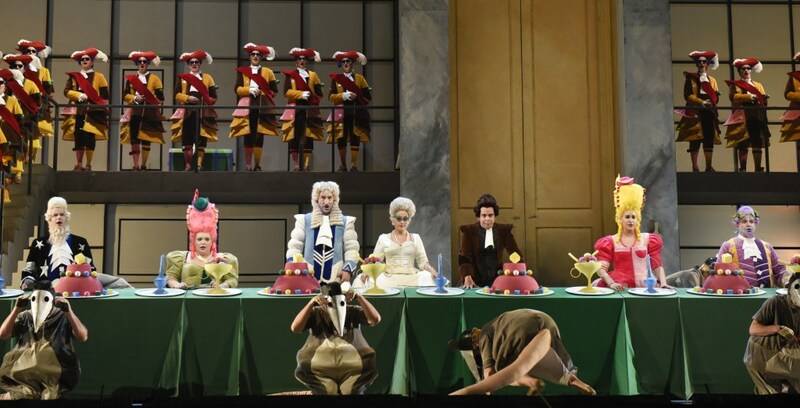 Although not a true buffo bass—with a vocal colour is on the lighter side of baritone—Pietro Spagnoli still got plenty of yucks as the greedy stepfather Don Magnifico; his “Sia qualunque” aria was a tour de force of rapid-fire vocal acting. From their first ridiculous appearance in poofy, Michelin Man bloomers, Lauren Margison and Rose Naggar-Tremblay were perfectly detestable as the wicked stepsisters. Margison’s clear soprano in particular carried easily over the ensemble and orchestra. As Alidoro, Kirk Eichelberger’s amazing Dumbledore-worthy costume did not compensate for his stiff acting and flat singing. In the pit the young Spanish conductor José Miguel Perez-Sierra showed refined attention to orchestral colour, but also a daredevil drive for speed, sometimes pushing the singers to the brink of intelligible diction. The woodwinds of the Orchestre Métropolitain sounded especially lively.